Dr. Markus Santoso is a pioneer in augmented reality applications, and we are glad that he has joined our LINDSAY team this summer. Over the last few months we have been diligently working on building a first prototype of wearable augmented reality applications for illustrating and exploring human anatomy and physiology. The following pictures and descriptions give a first glimpse of our LINDSAY anARtomy app, which we have created using the META 1 SDK. With anARtomy you can separate different virtual body systems (cardiovascular, muscular, skeletal, etc), grab them, adjust their size, and place them anywhere in real space. This allows for a custom anatomy display in any room. You can also use anARtomy to reveal the anatomical structures of your hands and arms, projected right onto your own body. META Spaceglasses is talking about our anARtomy app in a feature about “Augmented Reality in the Enterprise“. 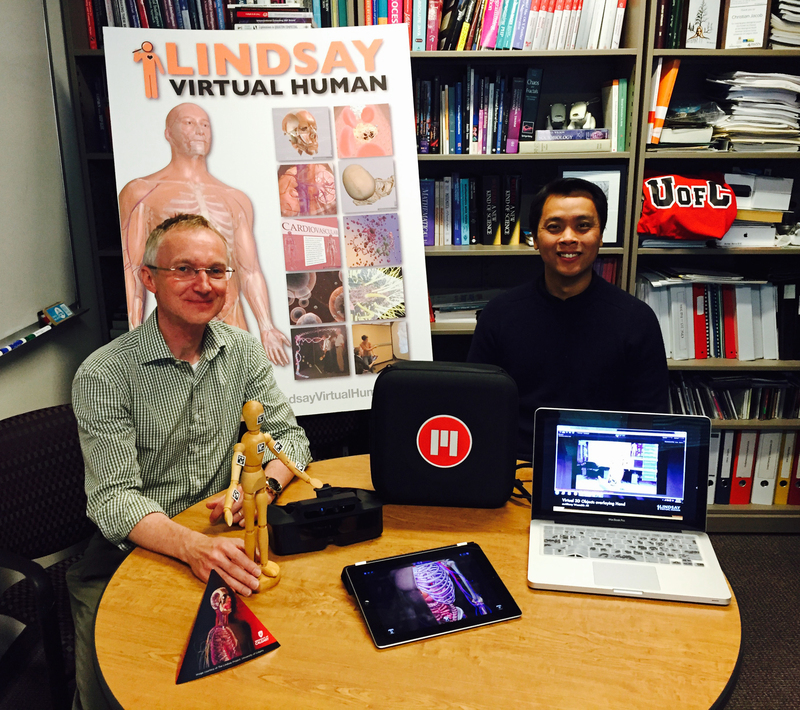 Please also check out our LINDSAY Virtual Human Video Channel, where you can find videos specifically about our LINDSAY anARtomy app and the many other projects we are working on. All 3D human anatomy models are provided by our industry partners at Zygote Media Group. Dr. Christian Jacob and Dr. Markus Santoso with displays of the META Space Glasses used to develop the augmented reality (AR) anARtomy application. Markus is an AR pioneer and has developed this app using the META 1 development kit. 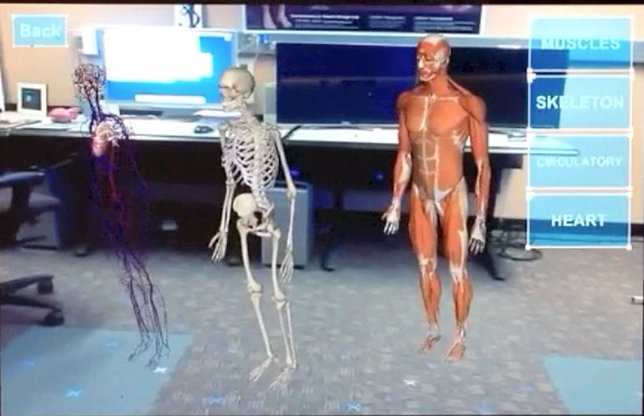 Setting up an AR Body Gallery: this is the view through the augmented reality META glasses, where we placed 3D models of the cardiovascular, skeletal and muscular systems on the floor of our lab. You can walk around these specimens, as they are placed in real coordinate space — hence the notion “augmented reality”, where a real space is augmented by virtual objects. 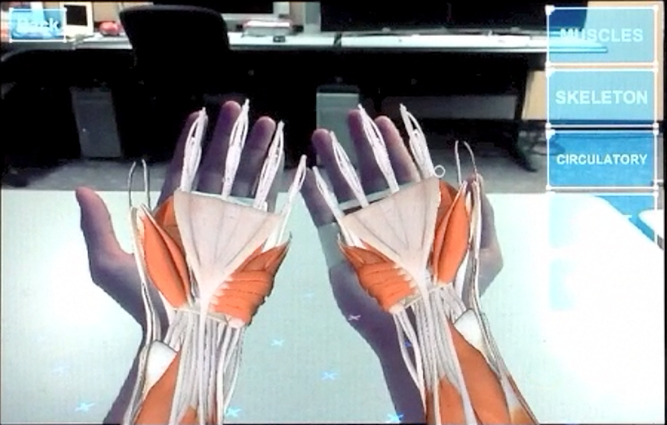 With markers on your hand, a 3D model of the skeletal system of your hands and arms is projected onto your own body. Proper alignment of the models and real-world objects (the extremities) still have to be worked on. 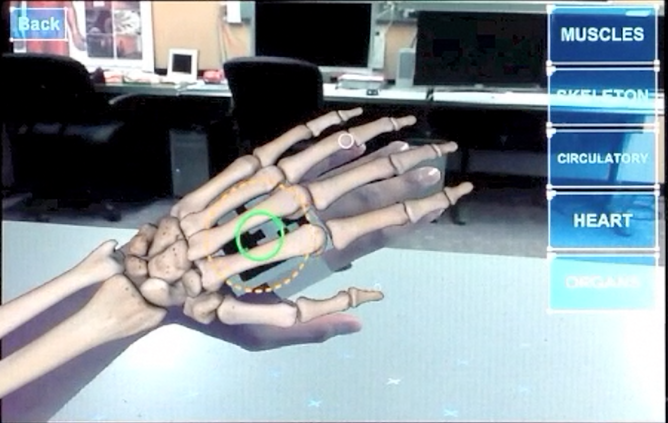 With markers on your hand, 3D models of the muscular and tendon structures of your hands and arms are projected onto your own body. Proper alignment of the models and real-world objects (the extremities) still have to be worked on. 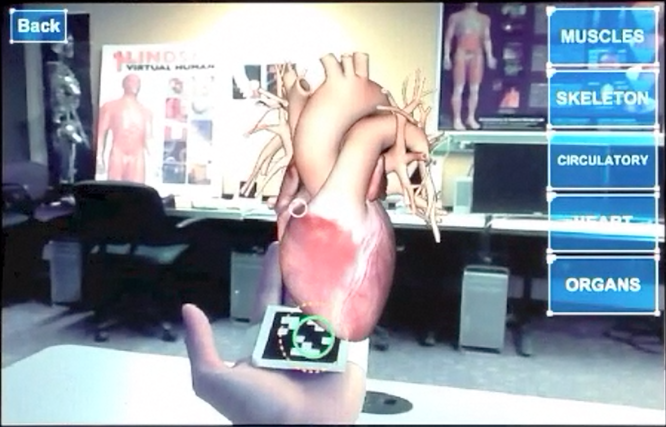 Holding a virtual heart in your own hand. The heart model also shows its pumping action, which one can see in our video. You can download the anARtomy markers here. This document contains instructions on how to print the markers and use them in the app to display the above anatomy models on your arms and hands. You will also need the META 1 SDK.